However, the “diverse backgrounds” Hanlon is referring to fall short of political ideology. It is important to note that political ideology is inherently different from race, gender, and sexual orientation as an identity category. Such identities are associated with far greater magnitudes of adversity. That being said, the lack of protections for students on campus with minority political views, particularly for those students on the political right, is still problematic. Those on the Right feel extremely troubled at Dartmouth, which claims to foster an open and diverse learning environment. Though there are a few prominent conservative voices on campus, the mainstream discourse is still largely left-leaning. The status quo at Dartmouth is to associate with the Democratic Party. As a result, the voice of the right is often misunderstood. Back on November 8th, Election Day, I was walking home from a viewing party when I saw someone I recognized from College Republicans, who had supported Donald Trump’s candidacy. I approached him, asking if he’d seen the news; he acted artificially indifferent and somewhat fearful until he recognized me. It appeared that he was afraid to show even a little happiness at his party’s victory. The day after the Election was characterized by a school-sanctioned state of mourning. Signs were posted everywhere about overcoming the “sadness” of the election; President Hanlon sent out a doomsday-style email about the implications of the election. Many students decried the results and spoke with others as if a national tragedy had just occurred. The sadness permeating campus was understandable given Trump’s rhetoric. However, such attitudes targeted Republicans in general, which led to confusion among Republican students; many felt alienated and misunderstood on campus. 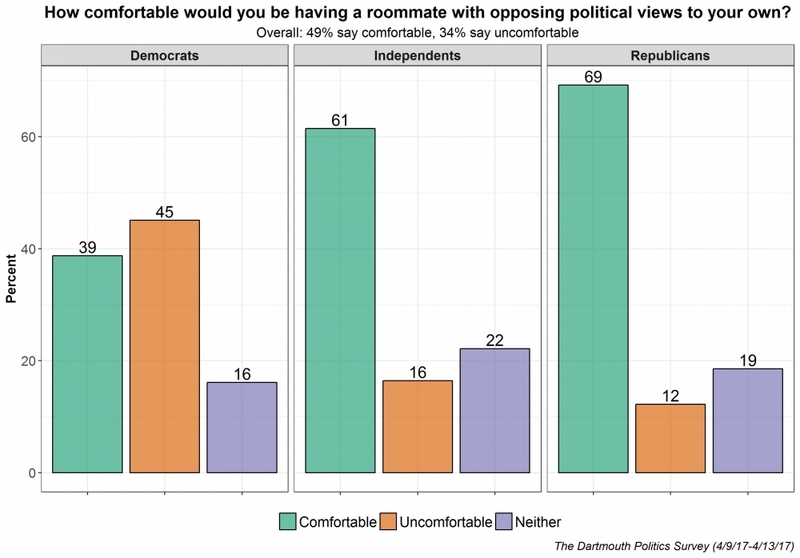 Most Republicans on campus with whom I’ve spoken believe that the suppression of their viewpoint is dangerous for Dartmouth’s climate of inclusivity and for political progress in general. Rushil Shukla ‘20 agrees that free speech on campus is endangered. He is worried about the slippery slope that mainstream discourse is heading down, which he believes is distorting the core intentions of free speech. Many Democrats agree the climate of suppression is toxic for everyone. Shawn Honaryar ‘20, a registered Democrat, regrets that Democrats enjoy the ability to openly express their views, while Republicans are openly scrutinized for the same acts. He hopes that in the future, all students’ viewpoints will be exchanged on a level playing field. The Left’s portrayal of the Right as “wrong” is not unreasonable. Donald J. Trump, the 45th President of the United States and the current face of the Republican Party, has done some objectively problematic things. He issued an executive order that banned the entry of non-citizens from Iran, Iraq, Libya, Somalia, Sudan, Syria, and Yemen, feeding into Islamophobic narratives unsubstantiated by the statistics on terror attacks. He is also calling for the construction of a wall along the Mexican-U.S. border and a crackdown on enforcement of immigration laws, using inflammatory rhetoric in the process. Thus, it is understandable that the portion of America that voted for Trump seems like a group of “deplorables” in the eyes of the Left. However, the mainstream, liberal-dominated discourse on college campuses fails to get at the root causes of support for Trump’s rhetoric and actions. It’s not the case, for instance, that everyone on the Right holds deep-rooted hatred towards Mexican-Americans. They simply advocate for obeying immigration laws and fear for their wages. In terms of the travel ban, Americans are concerned given the use of the Trojan horse strategy in the November 2015 Paris attacks, the San Bernardino attacks and the more recent Paris attacks on the Champs-Elysees. These new policies have less to do with political strategy more to do with the long-standing insecurities of many Americans, whether or not such fears are rational. The Right’s misrepresentation in mainstream discourse causes many people to overlook the root causes of conservative viewpoints. Silencing conservative voices rather than analyzing their origins only spurs political polarization in the US. For Dartmouth to heal its own divides, everyone must go the extra mile to transcend the norms of political discourse, and try to understand one another’s views more fully. Students from both the left and the right must reach out to each other and have meaningful, open, and receptive discourses, especially when tempers are high and animosity prevalent. Events like the debate hosted several weeks ago by the College Republicans and College Democrats represent a step in the right direction; with more events focused on promoting discourse, we can make sense of political divides, rather than taking them as a given.